The histogram shows a numeric value (the Y axis) against a distinct value (the X axis). The height of each column represents the value of the Y axis value. 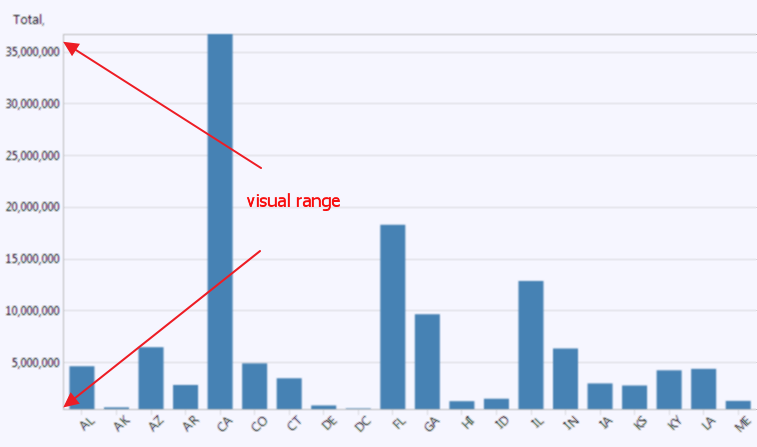 When rendering, the visualizer will determine the visual range on the Y axis from data, from example, if the minimum and maximum value from your data is 20 and 80, respectively, then the histogram’s Y axis will begin at 20 and end at 80. In the case of multi-series, sorting on the Y axis will only apply to the last (most recent) added data series. Sorting on the X axis is not affected by multi-series.